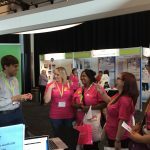 Self-care and prevention were high on the agenda when thousands of nurses, nursing students and healthcare assistants gathered in Liverpool in mid-May for four days of discussion at the Royal College of Nursing (RCN) 50th Congress. As a regular Congress attendee since 1987, albeit with a near decade-long gap while I worked abroad, Congress has always been a highlight on my professional calendar. It’s challenging, interesting, informative, educational, stimulating and exhausting in equal measure. Some things change and some seem to stay the same and this is also true of the people. Some of the organisational and content changes are incremental but shine a light towards a brighter future, despite the challenges nurses face every day. What never changes, however, is the commitment and passion for nursing and the provision of quality patient care. A non-nursing colleague attending Congress with me wondered if any other professional meeting generated such a sense of passion and community. “It really feels like a big family,” she commented. It has been particularly gratifying in recent years to see the increasing focus on encouraging participants to look after their own health and wellbeing – a topic dear to our hearts at C3, as witnessed by our work on nurses’ health. This year, participants had opportunities to have a health check-up; practice mindfulness; experience a hands-on natural complementary therapy; try yoga breathing and ‘laughter’ to improve sleep, boost the immune system and feel better; enjoy relaxing massages; and ease into the day by stretching. There were also workshops on ‘personal resilience’ and ‘spinal health’. A guided walk through the city illustrated some of the main events in Liverpool’s turbulent public health history. A pedometer challenge awarded delegates who accumulated the most steps each day. 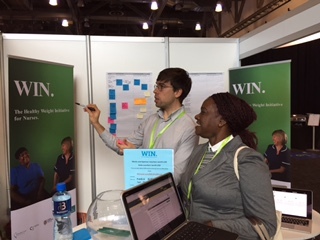 Thomas Kohut from Uscreates talks to a Congress attendee about WIN. It has also been interesting to witness the shift in focus on mental health as a mainstream issue that it is no longer the sole responsibility of mental health nurses but an essential component of every nurse’s practice. Politicians who addressed Congress, including the Leader of the Opposition, Jeremy Corbyn, and the Liberal Democrat leader, Tim Farron, urged that mental and physical health be treated equally so that people with mental health problems receive equal access to the most effective and safest care and treatment. They wanted equal efforts to improve the quality of care; the allocation of time, effort and resources on a basis commensurate with need; equal status within health care education and practice; equally high aspirations for service users; and equal status in the measurement of health outcomes. Congress participants gave countless examples exposing the clear gaps that exist between the rhetoric and the reality around mental health care. While this is distressing, the message from Congress was clear: mental health is every nurse’s business. This shift in focus on mental health is encouraging from our perspective at C3, where we hope that a similar shift will take place so that every nurse incorporates prevention as an essential part of their day to day practice and prevention is seen as not only every nurse’s business. One Congress discussion questioned the extent to which nurses can enable wellness as well as deliver care; focus on what matters to people rather than what is the matter with them. Delegates were keen to promote wellness but said they are often prevented by lack of resources, cultural barriers and attitudes. Some proposed that nurse-led wellness solutions could provide genuine financial savings and a better quality of life if nurses were given the opportunity to innovate and flex between traditional caring and enabling people and communities to find their own solutions. 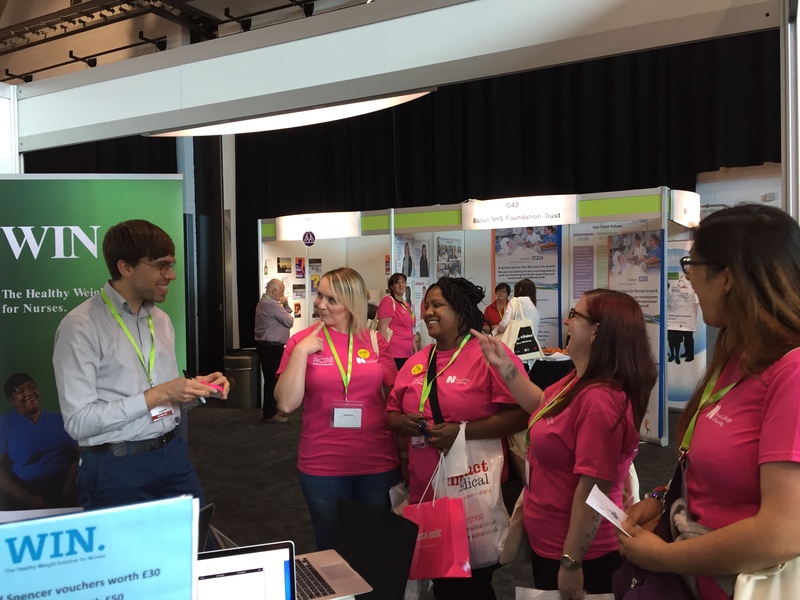 As always, RCN Congress provides a great platform for wide-ranging discussion and debate and we at C3 were gratified to see how our agenda for supporting nurses’ own health and their contribution to prevention resonated with the thousands of Congress participants. Read more about C3’s nursing programme.